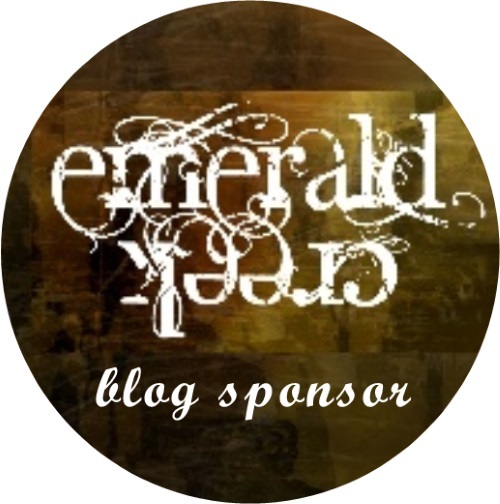 Welcome everyone - Brenda here with you today. Mixed media can mean different things to different people but basically it is about using various types of products (media) on the same piece of work and describes a genre of art work. 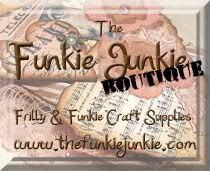 Here I have used paints, gesso, inks, paper and fabric to create my mixed media card. 1. Cut a piece of canvas to fit the size of my card (5 x 5). 2. With a palette knife and white gesso very lightly drag some across the canvas keeping the palette knife horizontal with the surface. 3. 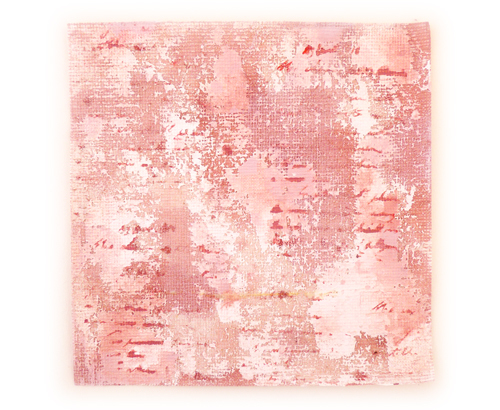 To add colour use cadmium red hue, titanium white, titan buf and burnt umber DecoArt media acrylics to make vintage pink and with very tiny amounts on a paint palette use a wetwipe and a water spritzer to rub colour on. When dry mix another shade of darker vintage pink, add some water so it is the consistency of single cream and spread it across your craft mat. 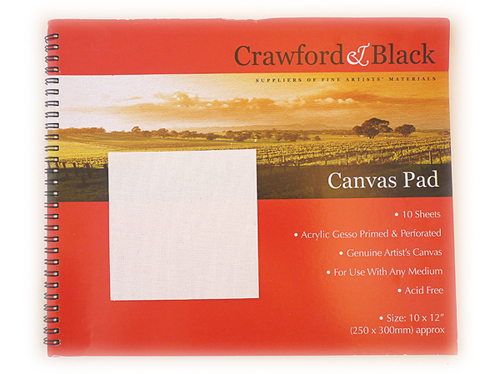 Dip the canvas randomly and dry to get a mottled effect. Keep the leftovers. Repeat the last step by mixing a very light vintage pink. 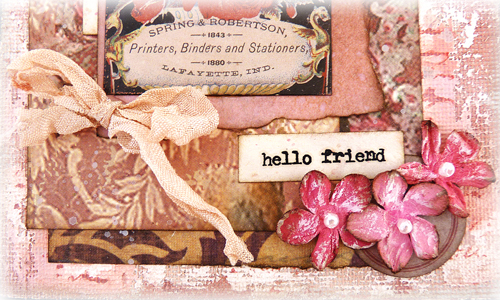 With the leftover dark pink stamp some text over the background. The paint sinks in and gives you a blurry text. 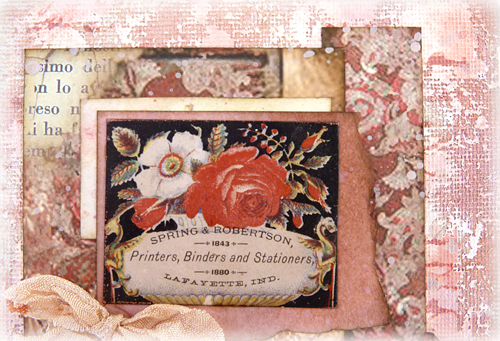 Mount on another piece of card or patterned paper and adhere to the card. 4. 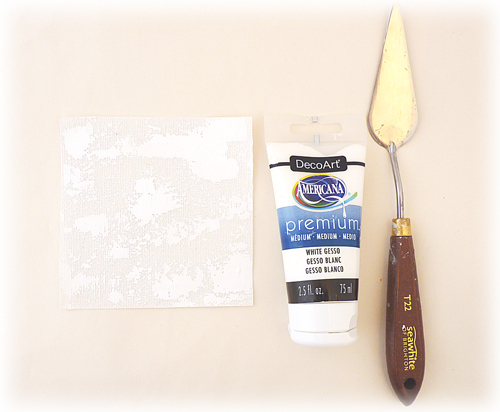 Use ephemera and patterned papers to cut and tear pieces to build a collage. As you have it layered up starting at the top take each piece and glue it to the piece underneath in your chosen design to create your layered collage piece. Adhere this to the background. Optional - Cover the focal image and add some splattering with slightly pink watery paint. 5. 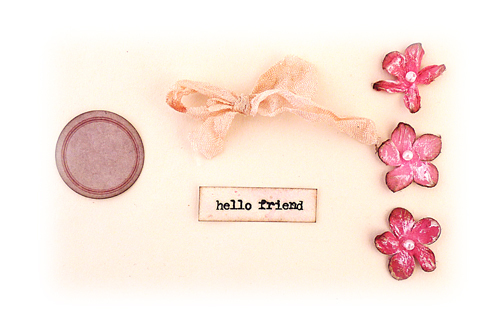 Find some simple embellishments - as this is pink and flowery I chose some little mini flowers, created a bow from paint dyed vintage style ribbon, added the circular piece for more interest and made a greeting from remnant rubs and ink splattered paper. Adhere these to the card. I always ink the edges of my papers with brown distress ink and also added some gesso and ink to the flowers. Eh voila you have a beautifully layered card that (hopefully) is still thin enough to go in the post (I'm keeping my fingers crossed). All the pieces have very similar tones leaving the focal ephemera piece to really stand out. 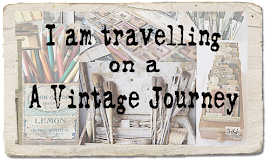 I hope you have enjoyed reading through and if you love collage like I do maybe it will inspire you to get out the paints, papers and ephemera to have a go for yourself. We look forward to seeing you again next week when the October challenge begins. 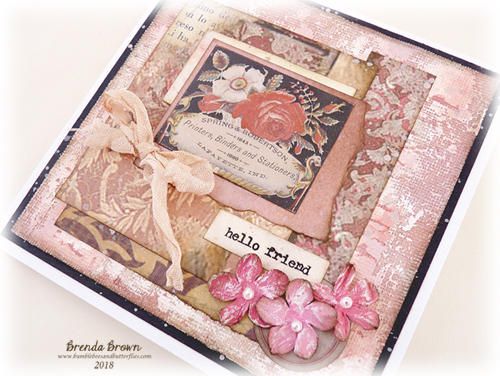 Gorgeous card, Brenda . 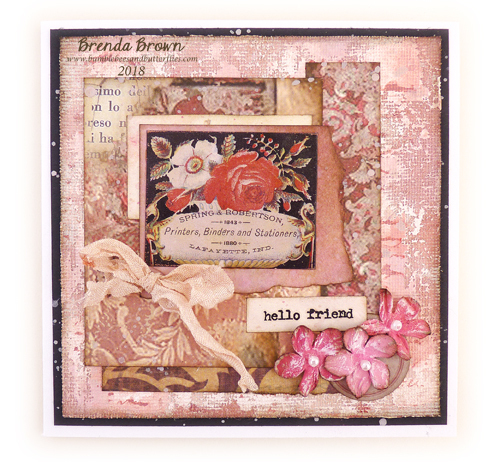 Wonderful to see the process steps and how you worked your mediums .Lovely tones of pink and as always you collaging is spot on . Sorry to be late catching up - this card is just lovely. The texture from the canvas and those scraped on paints is wonderful, and your layers give a beautifully shabby chic look to the whole thing. 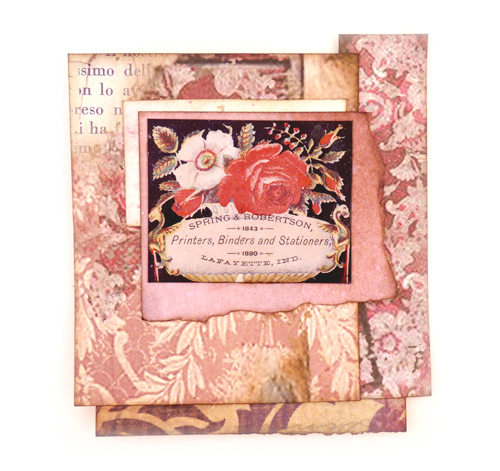 A fabulous mixed media card.